An interesting game for GS Petroliers (7-0) which played road game in Setif against 3rd placed USS (4-3). Leader GS Petroliers had an easy win 91-61. Undefeated GS Petroliers have an impressive series of seven victories in a row. Defending champion maintains first place with 7-0 record. USS at the other side dropped to the fourth position with three games lost. Bottom-ranked USMB is still unable to win any game. This time they lost on the road their seventh consecutive match to fourth ranked WA Boufarik (5-2) 83-76. WA Boufarik moved-up to third place. USMB lost their seventh game in a row. They still close the standings with seven games lost. The game in B.B. Arreridj was also quite interesting. Second ranked Staoueli (6-1) played at the court of 6th ranked IRB Arreridj (2-5). Staoueli managed to secure a 4-point victory 80-76 on Monday. The victory was the third consecutive win for Staoueli. They maintain second place with 6-1 record behind leader OS Arreridj. Loser IRB Arreridj dropped to the seventh position with five games lost. The game in El-Beida was also worth to mention about. 5th ranked NAH Dey (3-4) played at the court of seventh ranked CRB Dar El-B. (3-4). CRB Dar El-B. managed to secure a 4-point victory 78-74. CRB Dar El-B. moved-up to fifth place, which they share with defeated NAH Dey. NAH Dey lost their third game in a row. An interesting game for GS Petroliers (7-0) which played road game in Setif against 3rd placed USS (4-3). Leader GS Petroliers had an easy win 91-61. 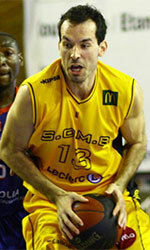 GS Petroliers have an impressive series of seven victories in a row. Defending champion maintains first place with 7-0 record. USS at the other side dropped to the fourth position with three games lost.